The link to the demo does not work…. But how to view/display a pdf file from report? Thanks for showing these new attributes off. Do you have any idea if they’ve enhanced the display of the resulting tag so it will display file names longer than 30 characters? I’ve found that annoying for a long time. I believe you can change it by setting the width attribute, although I’m not sure if this works the same across all browsers. e.g. in my demo I’ve set Custom Attributes to style="width:500px"
why on upload file not show image or preview befor insert into table? or how show preview image for upload file? If you would like to show a preview of the image, I recommend using the DropZone plugin which has this feature built-in. How can i get the code of the application ? Hi, great work. Thanks lot. this functions may be useful. –PA_DEFS.UUID36_TYPE is varchar2(36 byte) parameter. Can we implement download button for each row in Interactive grid like IR? If we can, please suggest..
How do you clear out the Interactive grid on each successive “upload”?? I would think that APEX_APPLICATION_TEMP_FILES needs to be deleted before each “upload”?? If you want to clear out the temp table you can just add a PL/SQL process that runs DELETE APEX_APPLICATION_TEMP_FILES;. In my application, I haven’t bothered because this table should get automatically purged some time after the session has ended. When I add a process to “delete” the data it seems to delete the “temp” files before it has a chance to load them. I want the “temp” files delleted after they’re loaded into the grid. Where would I put the “delete” statement?? Check the order in which the processes are run – make sure your delete occurs after submit, after your process runs which copies the files to their intended destination. If you’d like more assistance, please recreate your process on apex.oracle.com and I may be able to help you. Alternatively, describe exactly what you mean by “loading the files into the grid”. Hey Jeff, sorry, I’ve not been able to get back to your question. 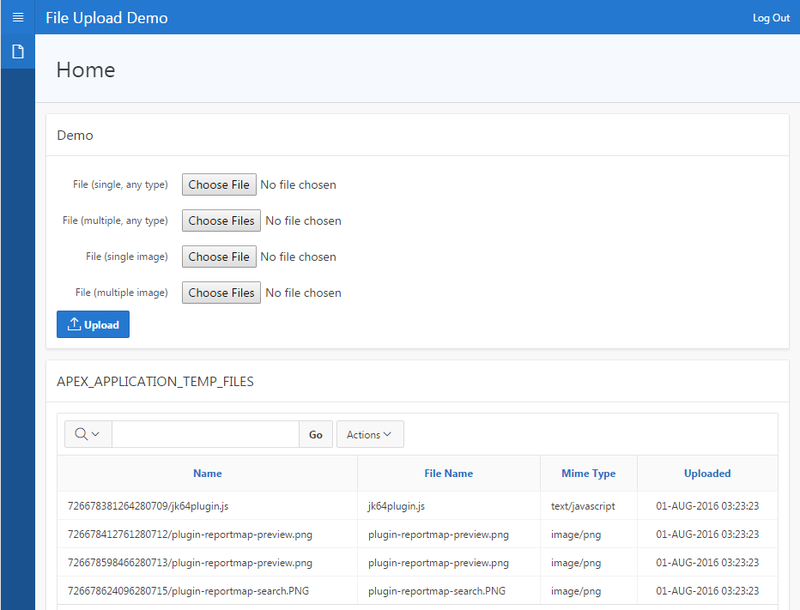 which after you select a file from the file browser, press upload, that file is put into the Interactive Report(IR) “APEX_APPLICATION_TEMP_FILES” via the select statement “select * from apex_application_temp_files”. Let’s say I select one file only and press “Update”. That one file is loaded into the IR. I then select another file(only 1 file) and press “Update”. That file is ALSO added to the IR BUT now there are two records. I only want the latest record to display in the IR. How do you “clear/purge/refresh” the IR to remove the “first” record and ONLY display the latest record. In that case I would question why you need to report from the apex_application_temp_files table in the first place. The reason the table allows multiple records is because the user may be allowed to upload multiple files in one go. Normally you would design the process so that it copies the files out of apex_application_temp_files, storing them in your own database table(s), and then delete them from the apex_application_temp_files table. That way the temp table is clear when the user wants to upload more file(s). Alternatively, if you wish to use the apex_application_temp_files table as a sort of “preview” area before the user “processes” the files, you could add a “Clear” button which the user may click to clear out the table. This button would invoke a process which deletes the rows from apex_application_temp_files. Jeff, that is close to what I want to do. I plan to load multiple files into my table. 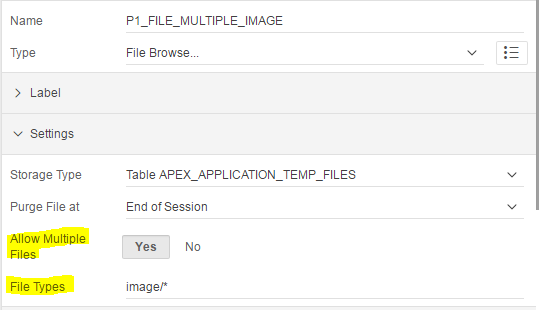 Let’s say a user tries to load 3 files into apex_application_temp_files which will call a “page submit” process to try and insert into my table. If 1 of the 3 files is incorrect(wrong extension or something), I want to display the 3 files on an IR so the user knows which files they tried to upload. The user will need to re-select the 2 files that are “good” and then insert them. I plan on deleting the apex_application_temp_files at that time. I believe as it works now, the IR will show the 3 files from the first upload try and 2 more files on the second upload attempt thus producing 5 rows in the IR. Somehow(Dynamic Action?? ), I want to clear/purge the IR when the user presses the “Upload” button so I know the IR is empty before trying to display any apex_application_temp_files . By the way, I did a brief Dynamic action to try and insert the records from apex_application_temp_files but it seemed that those “files” were NOT stored there unless I did a “Page Submit”. Does this seem correct?? When the user clicks “Upload”, if it is doing a page submit then you should be able to do whatever you need to do (e.g. clear out apex_application_temp_files) as a normal on page submit process. You shouldn’t need a DA for that. Yes, the files don’t get uploaded and stored unless you issue a page submit. This is great, it helped me a lot. I was able to upload multiple files into my custom table using your suggested code. I am very grateful. Under “Setting” set “File Types” with the following content to restrict file browse to XLSX only. Many thanks for this clear article ! I’m trying to use the upload method to send e-mails with attachments (without saving them), but I’m stucked. Could you please help?